Tri-Valley-San Joaquin Valley Regional Rail Authority is an agency established by AB 758 in 2017 to plan and build a rail connection between BART and ACE in the Tri-Valley area. Some feel that a dedicated agency is necessary because they think that BART hasn’t been a strong advocate for extending BART to Livermore. For many years, BART has been criticized for extending the BART system to ex-urban communities that heavily rely on park and ride lots and do not support transit oriented developments. Since 2000, there has been gradual turnover on the BART board where newly elected BART members prioritize core system improvements over suburban extensions. 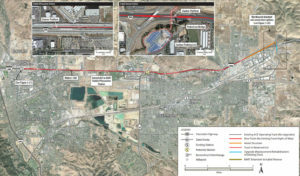 BART’s initial study for Livermore extension include a line to Downtown Livermore to encourage transit oriented developments, rather than a line that runs straight down the I-580 median. However some local groups in Livermore want to keep BART in the freeway median and keep Livermore suburban. They were able to convince the Livermore City Council to support BART in the freeway median. BART in 2017 released an EIR to extend BART or DMU down the freeway median to Isabel Road, west of downtown Livermore. The alignment for the initial portion is not under dispute. Trains could go downtown, or further east along the freeway. The BART board voted down the plan to extend BART to Livermore in May 2018. BART’s action leaves funding available to the Tri-Valley-San Joaquin Valley Regional Rail Authority to pursue a rail project to connect with BART and Dublin/Pleasanton. As a part of ACEforward, ACE studied extending commuter rail or DMU on the freeway median to connect with BART at Dublin/Pleasanton or somewhere in between. Given the difficulty to expand rail capacity through the Niles Canyon, a BART connection to Oakland and San Francisco would be highly desirable to justify a dedicated passenger rail corridor over the Altamont. Since San Joaquin County already runs and owns the ACE system, it would be less costly and more politically advantageous for ACE to extend its system in the Tri-Valley to meet BART. For BART to extend its wide-gauge system outside the BART district, an agreement would be necessary for an outside county to “buy-in” to BART. BART also has not been able to enlarge its district in its history, yet BART has opened its first standard gauge line (eBART). In July 2018, Tri-Valley – San Joaquin Valley Regional Rail Authority approved an alternative for the rail link between ACE and BART called Valley Link. The proposal was built upon studies conducted by BART and ACE. Project calls for eBART type service between Dublin/Pleasanton BART and Lathrop. BART level peak service would be provided between Dublin and Greenville Road, with every other train continuing east of Greenville. Future project would be an extension to Stockton. Valley Link would use the I-580 median in the Tri-Valley area. In the Altamont Pass, the line would use a former Southern Pacific right of way currently owned by Alameda County. In the Central Valley, the line would use one of the Union Pacific right of ways. The authority is composed of 15 members representing the Tri-Valley cities, the Central Valley cities, and BART. LAVTA (bus agency in the Tri-Valley area) will act as the management agency.